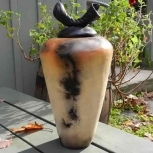 This half sized raku urn is a dramatic, beautiful final resting place for one you love. 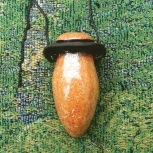 The oval hollow displays a beautiful piece of natural amethyst. 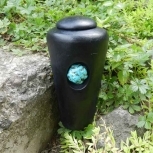 The body of the urn has a black satin stoneware glaze. It may be displayed outdoors. 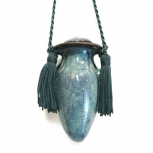 The oval hollow displays a cluster of beautiful amethyst crystals. Amethyst is believed to promote calmness, balance, patience and peace. Once a year I go to the Bancroft Gem Fair to find the best crystal specimens. 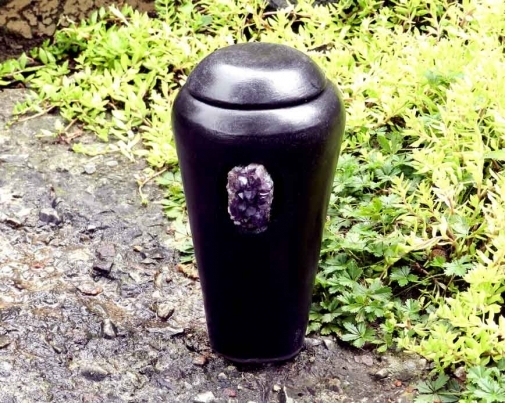 Then I hand build the urn with a custom sized recess to fit the individual stone. 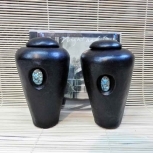 The urn measures 8.5 inches high and 4.5 inches wide. 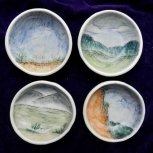 It holds half the volume of a standard temporary cremation container, or about 4 cups. As a pet urn, it would accommodate a husky, lab or retriever. $60.00 CAD by Can. Post.